Science fiction and fantasy grew me up. I suppose I could have been raised by another genre, but I was a boy in the Sixties and the choices were limited. Horror was associated with comic books. Western novels were fading. War stories languished in a gulf between the memory of WWII and a future terrorism. Romance was the governess of girls, not boys, and literature was what they made you read in school. So, for a book-reading boy, science fiction and fantasy was it, and I’m grateful for that, because I think it gave me something the others couldn’t – a sense of awe. I read, and Ray Bradbury took me up to the Martian mountaintop and showed me a desperate, dry expanse. I read, and Arthur C. Clarke sent the millennia scuttling like a slinky down the stairs. I read, and Ursula K. Le Guin and Cordwainer Smith grabbed me by my skinny shoulders and shook me, asking, “Who do you think you are?” Could I ever recover from that? And it didn’t end with childhood. The old authors remained to be reread, and William Gibson, China Mieville, Jo Walton, were waiting and writing. Their books kept at me, challenging me, amazing me, chivying me away from complacency. I grew up learning to analyze because I was confronted by the alien on page after page. I questioned the easy racism of my youth because some of my heroes didn’t look like me. I distrusted power and valued humanity in all its odd glory because, in the void, only the one would save you. A world view based on wonder. It made for a nice set of ethics. At some point in our lives, we all want the walls to explode, to disintegrate and let a bright light and a cold wind come rushing in. Drugs, booze, and chasing danger will do that – until their walls close in. Birth, death, and love will also serve, if you can separate them from the dross of everyday life. Religion works for some. But for my money, paid cheerfully at White Dwarf Books in Vancouver when possible and to the big chains when necessary, science fiction and fantasy are the best and craftiest transmitters of awe. Source: Info in the About City of Demons was from the media kit provided by the promotions agency. Kevin Harkness is a Vancouver, British Columbia writer who writes in various genres but loves science fiction and fantasy best. 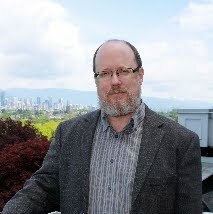 Tyche Books will publish his first novel, a YA fantasy titled City of Demons, in July of 2012. Kevin has just finished a third career as a high-school teacher. His first two careers: industrial 911 operator and late-blooming university student, were nowhere near as dangerous and exciting as teaching Grade 10s the mysteries of grammar and the joys of To Kill a Mockingbird. He also taught Mandarin Chinese – but that’s another story. Outside of family and friends, he has three passions: a guitar he can’t really play, martial arts of any kind from karate to fencing, and reading really good stories. In this fourth career, as a writer, he attempts young adult fiction, science fiction, fantasy, and horror. Yikes, that is quite a monster they are fighting! Now that sounds like a cool fantasy read. Thanks for the guest post, and yes, glad no zombie books then. lol. Thank you!